SIGHT HOUND: Dogs that hunt by sight rather than scent. Because they hunt by sight, greyhounds should never be allowed to run loose unless in a completely safe and secure fenced-in area. Once they catch sight of something of interest they will go into pursuit mode. They will not see anything else or hear your call once they have fixed on their prey whether it’s another animal or a tissue blowing across the road. Their sight is so much more sophisticated than ours and greys can see up to a mile. Being either leashed or in a fenced area is a must for the safety of any sight hound. COCKROACH: Sometimes called “roaching” or “dead cockroach” A typical greyhound sleeping position, where the dog lays upside down with three or four of its legs stuck straight up in the air. You know your greyhound feels safe and comfortable when you find them sleeping in this position. Most often accompanied by CRUNCHY TONGUE. CRUNCHY TONGUE: This is the most ridiculous thing the greys do when either asleep in the cockroach position or shaking their heads. Their tongues will fall out the sides of their mouths, often resulting in the tongues actually drying out and sticking to the floor or carpeting. It’s hard to pull off that regal and sophisticated demeanor when they look like they have a screw loose! HAPPY DANCE: Reaching for the treat bag, saying the magic word (walkies?) or just coming in the front door and you have yourself the happy dance. There will be dancing, smiling, spinning, jumping, twisting, half flips and if you have a talker in your home this will be the time you will hear some roo’ing. CRUNCHY-FACE: The technical term for the food stuffs that attach to lips and whiskers in a gooey wet mess and end up drying to a nice crisp, hard to wipe off, equivalent to a greyhound moustache. You may find your dog attempting to keep themselves clean by using the front and sides of your furniture or your pant leg for face wiping. NIT: Is when the dog rapidly nibbles, using just their front teeth, on someone or something. Often it’s the edge of the couch or bed. It is not intended to hurt but seems to be an expression of affection or need for attention. know that they are so happy to see you! LEANING:Anyone who has a Greyhound will know the lean! It’s their version of a greyhound hug. It’s a show of affection and trust. 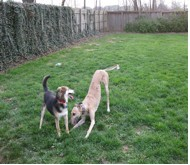 Make sure both of your legs are planted firmly when a greyhound is around! ﻿HELICOPTER TAIL:﻿ Just as it sounds. Some greyhounds when worked up will twirl it around in a circle very fast. It’s only a matter of time before one of them becomes airborne! Stand back when this happy tail gets going. ROO’ING: This is greyhound singing! If you start them off with a howling like a wolf (Arrrr Arrrooooo), they will often join in. It’s quite spine tingling to hear a bunch of greys all roo’ing at once. It is very funny and endearing. EAR-GASM: My absolutely favorite sound! Most greyhounds just love to get their ears rubbed. If you do it just right, you can see the dog not only roll her eyes around in an expression of pure bliss, but you'll hear the most amazing assortment of moaning and groaning of sheer pleasure from your dog. SCHNOOFLES: Oh my! Anyone who has a dog taller than knee-high will know what this is. There is nothing like being greeted first thing in the morning (or anytime of day for that matter) with an ice cold wet nose twitching, snorting and worming its way into your ear, armpits, under your covers or heaven forbid if your standing without long pants on- a good goosing! Better than any cup of coffee will accomplish. Not recommended for the faint of heart. SMILE: A greyhound smile almost looks like a snarl, except the top of the muzzle isn't pulled back. They have a way of lifting their front lips and to show their teeth and it looks like much like a human smile. SPHINX/ANGEL: Greyhounds will often assume the same position as the Egyptian Sphinx. Because of the way they are built this position is much easier for them and many greyhounds find it uncomfortable to sit in the standard sitting position. SCRITCHES: This is a greyhound scratch usually behind the ear or at the base of the tail. Best done in short fast furious strokes. If you hit just the right spot you may get to see that involuntary hind leg spasm that is guaranteed to produce a fit of giggles.